After several small delays, Transformers: Legacy – A Celebration Of Transformers Package Art Book release date has been pushed to next year. Targeted initially to release mid this year to coincide with the 30th Anniversary of the Transformers Franchise, the book was to showcase the packaging art of the Transformers toys throughout the first 10 years. Remember the thrill of tearing open a gift on Christmas morning, discovering a brand-new Transformer in a shiny new box? While the toys were amazing in their own right, what made the packages stand head-and-shoulders above the myriad competing action figures on shelves was the stunning box art. Transformers: Legacy collects hundreds of beautifully airbrushed paintings from the iconic first decade of The Transformers. Hasbro, Takara, and private collectors opened their archives, yielding an unparalled level of quality. Essays and interviews from the original illustrators give unprecedented insight into the process behind the art. This book is chock-full of extras, including never-before-seen artwork from toys that never were, original design sketches, catalog artwork, and more. I'd like to have seen individual credits too. Even as a child, the different styles of each artist for the characters on the boxes seemed well defined to me. So maybe even if we don't know who did them we could still group the illustrations according to style… For instance, we know that Jeff Mangiat did the 2nd and 3rd back-of-box murals as well as Optimus Prime, Jazz and Mirage (from an interview he did)… and I'd say it's pretty certain he was also responsible for Ratchet and Ironhide, who share the same clean painted lines, as well as Sideswipe and Sunstreaker. Whereas something like Wheeljack is very different, much softer and airbrushed-looking, deviating more from the toy design with smoother features, the same styling as Smokescreen. I'm sure we could divide many more of them up by artist the same way. I'm thrilled with what we got, that this book actually exists, but I would've killed for each piece of art credited to its respective artist. I'm not sure if this has already been said in this thread, or if I picked up on this elsewhere. As I understand it, the editors of Legacy would have liked that, too. But as they got into it, it became clear that, for a great many pieces, no one knows who did the art any more, or they may have an idea, but can't verify it (I'm thinking of the idea, widely held in the fandom many years ago, that Romita did the animation designs for the original cartoon. It was later proven that most of this work was instead done by Floro Dery). Rather than credit only some artists and not others, and/or crediting some works incorrectly, they chose this route instead. Was also a (late) Christmas-gift for me, love this book. I was positively surprised that even the Japanese stuff is in there. Soon Star Saber, soon. They obviously had to draw the line somewhere, but man I would like to see some BW packaging art in book-form. They had some wicked looking artwork on these boxes as well. My wife gave me this for Christmas – FINALLY! I'd been waiting for what feels like years for this thing! Could not be happier. Dream come true. Btw, which pieces were omitted from '84-88 besides Jetfire? Finally got my copy and there's not much I can add that other people haven't already said…BUY THIS BOOK. It's just lovely. So many details in the drawings I never noticed before. My one complaint is that my favorite piece, the 1988 packaging back collage, (with Powermaster Prime and the Pretenders,) looks quite blurry and washed out. Obviously this was a case where they did the best they could do, but it was just bad luck that my FAVORITE piece was the only one not presented "perfectly." But that's a minor quibble…the rest of the book is just amazing. Bravo to everyone involved with its production! I'm late to the party, but… I got the book last week at my local comic book store, and it is incredible! I paid cover price for it because I like to support my local store, so I was a little scared of how much I would like it once I got home and opened it. It is superb! On my first pass, I looked at every single page and probably spent about an hour with the book. Numerous times since then I have dipped in and out of the book and am blown away each time. As a graphic designer and illustrator, the Transformers packaging art has always been a source of inspiration for me, so having much of it in one place is a tremendous resource. Add me to the list of people who would be interested in a Beast Wars book. In fact, after looking through the book I became quite curious as to whether there is a "Botch"-like resource out there that collects the Beast Wars package art..? I know TFWiki has it for most characters, but the images are small. Does anyone know if there is anything better? If you haven't picked this up yet, amazon has 30% off any one book. Use code HOLIDAY30. That should make it right under $23, free shipping with Prime. So much quality artwork, I wonder how long the artists took over each piece of work? Must be thousands of man-hours in there. Who the heck is the guy sitting in the rear right seat of Actionmaster Optimus Prime's Armored Convoy vehicle?! 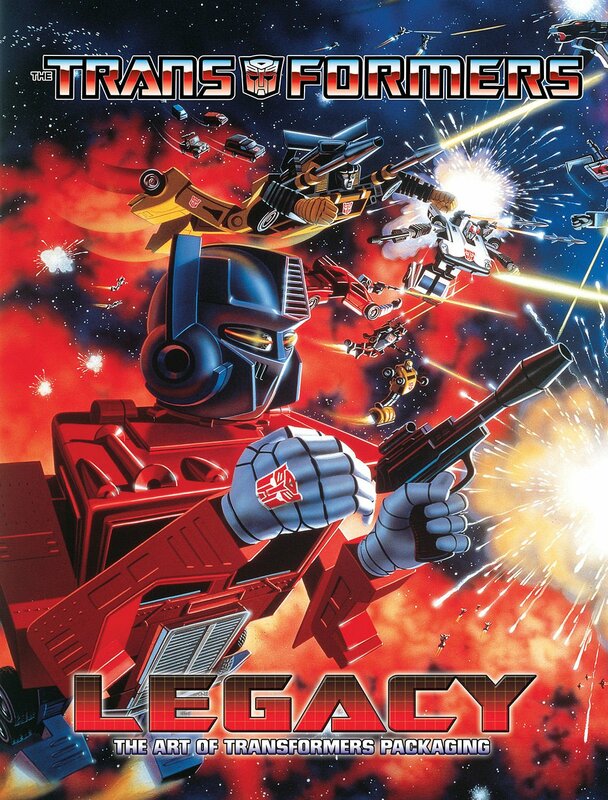 He's there again in the same seat on the 1990 box art. And one final observation; I noticed a few characters have had their artwork flipped over (such as Nightbeat, Windsweeper, Sureshot, Chase). It's a silly thing but somehow it makes their art look 'not right' in my brain, it doesn't jog the memory the way the other stuff does. Was this done to balance certain page layouts/fit available space? Or maybe that's how the original art was drawn and it was mirrored for the G1 box? Or is it just accidental error that went unnoticed during production of the book? Rik Alavares books, while not complete, can probably be picked up cheap. Such an awesome book,most of these character art and characters Ive never seen before so this has been quite the surprise. Suddenly Im getting the itch to buy some more G1 figures . Has there been a book released that has all the pics of the actual G1 toys?? My copy finally arrived today; it's beautiful. Such a shame about the lack of Euro G1 items, but whatchagonnado? No doubt covered already in the thread so apologies if that is the case but was this down to a lack of quality decent sized images? Yep. Jim has said that it was either originals or nothing. Scans of the packaging wouldn't have been up to the standard of quality that he was going for. This book is great! Had mine on order since Xmas '13 and it has sooooo been worth the wait! My only gripe would be the omission of jetfire (just read something about this being down to legals?) and the omitted euro back of box featuring overlord and motorvators and back of box featuring the turbo masters & predators. No doubt covered already in the thread so apologies if that is the case but was this down to a lack of quality decent sized images? Anyone else order this from Barnes & Noble and still waiting on it? Yep just got this book in the mail today & it's totally worth the hype! I'm so glad the book managed to be released before end of the year 2014, a fitting close for the TF franchise celebrating it's 30th anniversary. Received mine yesterday. Beautiful book and very happy with my purchase. I'm of course mostly interested in the nostalgia part of the book, so the Japanese series were literally glossed through; even the diaclone part interested me more. But still a shame that Jetfire's missing and of course most of the European 1991/1992 figures. Those were also a big part of me remembering G1 toys, even though I never bought one at the time. Was Rotorstorm and Thunderclash in it? I flipped through my copy and didn't find them. I figured it had to do with the Lawsuit that HG had with Hasbro. I remember last year HG had a suit against Hasbro regarding the Jetfire/Hound Transformers/GI Joe set. Funny the authors of the Legacy book caved it that was the case. Pretty sure the authors of this book don't decide on legal actions on their own, there are people up in the chain, at IDW, but probably mainly at Hasbro, who decide when some things can't fly.